Network administrators can install SNMP (Simple Network Management Protocol) software on network computers so they can monitor projectors. If your network uses this software, you can set up the projector for SNMP monitoring. Turn on the SNMP setting. 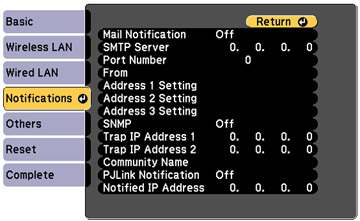 Enter up to two IP addresses to receive SNMP notifications as the Trap IP Address setting, using 0 to 255 for each address field. If you want to use the Secure HTTP protocol to encrypt communication when using Web Control, turn on the Secure HTTP setting and import the web server certificate using the Web Server Cert. setting. If available, select the Priority Gateway setting for your network. If your network environment uses a Crestron Connected controller, turn on the Crestron Connected setting to allow the projector to be detected. 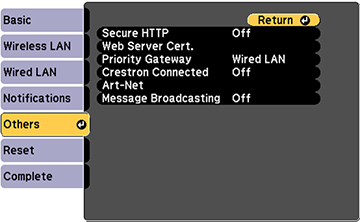 If your network environment uses an Art-Net communication protocol, turn on the Art-Net setting. If you want this projector to receive broadcast messages over the network, turn on the Message Broadcasting setting. Administrators can broadcast messages over the network using the Epson Projector Management software.